Definition at line 63 of file aes.h. Definition at line 665 of file aes.cpp. Definition at line 73 of file aes.h. Definition at line 611 of file aes.cpp. Definition at line 576 of file aes.cpp. Definition at line 72 of file aes.h. Definition at line 476 of file aes.cpp. Definition at line 472 of file aes.cpp. 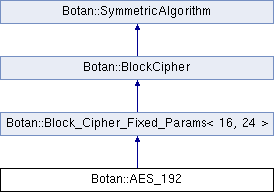 Referenced by Botan::Salsa20::cipher(), Botan::CTR_BE::cipher(), Botan::RC4::cipher(), Botan::SHAKE_128_Cipher::cipher(), Botan::ChaCha::cipher(), Botan::Poly1305::clear(), Botan::DESX::decrypt_n(), Botan::Twofish::decrypt_n(), Botan::KASUMI::decrypt_n(), Botan::Noekeon::decrypt_n(), Botan::Blowfish::decrypt_n(), Botan::XTEA::decrypt_n(), Botan::IDEA::decrypt_n(), Botan::MISTY1::decrypt_n(), Botan::SEED::decrypt_n(), Botan::CAST_256::decrypt_n(), Botan::SM4::decrypt_n(), Botan::CAST_128::decrypt_n(), Botan::SHACAL2::decrypt_n(), Botan::DES::decrypt_n(), Botan::Threefish_512::decrypt_n(), Botan::Serpent::decrypt_n(), Botan::Lion::decrypt_n(), Botan::TripleDES::decrypt_n(), Botan::GOST_28147_89::decrypt_n(), Botan::DES::encrypt_n(), Botan::SHACAL2::encrypt_n(), Botan::IDEA::encrypt_n(), Botan::Blowfish::encrypt_n(), Botan::SEED::encrypt_n(), Botan::KASUMI::encrypt_n(), Botan::Twofish::encrypt_n(), Botan::XTEA::encrypt_n(), Botan::SM4::encrypt_n(), Botan::MISTY1::encrypt_n(), Botan::DESX::encrypt_n(), Botan::Noekeon::encrypt_n(), Botan::CAST_128::encrypt_n(), Botan::CAST_256::encrypt_n(), Botan::Threefish_512::encrypt_n(), Botan::Serpent::encrypt_n(), Botan::Lion::encrypt_n(), Botan::TripleDES::encrypt_n(), Botan::GOST_28147_89::encrypt_n(), Botan::OCB_Encryption::finish(), Botan::OCB_Decryption::finish(), Botan::GHASH::ghash_update(), Botan::CFB_Encryption::process(), Botan::CFB_Decryption::process(), Botan::Salsa20::seek(), Botan::CTR_BE::seek(), Botan::ChaCha::seek(), Botan::OCB_Mode::set_associated_data(), Botan::Salsa20::set_iv(), Botan::ChaCha::set_iv(), Botan::GHASH::update(), Botan::GHASH::update_associated_data(), Botan::CFB_Mode::valid_nonce_length(), and Botan::ChaCha::write_keystream().